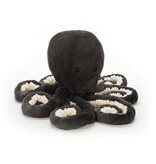 7” Inky Octopus gives the very best hugs - eight at a time! Blue-black and squashy, with scrummy cordy tentacles, this funny octopus loves to play! Pull those long, curly arms to watch them ping back into place! Inky loves to swish about, but prefers to ride on a good friend's head! SAFETY & CARE Tested against and passed ASTM requirements. Suitable from birth. Huge and Large sizes - please do not leave in a cot/ crib. Made from 100% polyester. Hand wash only; do not tumble dry, dry clean or iron. Not recommended to clean in a washing machine.